Last edited by Scott Farris on Thu Jun 01, 2017 11:36 am, edited 6 times in total. Looks good! , i really like the X emblem in the middle, how is the ride different from the pathfinder? I have a 99 pathfinder but i am planning on upgrading to an Xterra after im done with my pathfinder build or whenver my pathfinder dies whatever comes first haha. That's not a real fair question because I believe the 2002 Pathfinder (SE 4X4) was a new generation from the the 99. It was a cushier ride then the X, with its welded Monoframe construction and 5-link coil spring rear. Power was slightly less W/ 250HP/240T 5 speed MT Vs the X's 261HP/281T 6 MT. I miss the simple luxury items like heated mirrors and windows that would power down if you held the unlock button on the key fob. But I really like the X's ride and pep, although the 33" mud terrains have impacted it slightly. The locker Vs the limited slip isn't even close, I love the locker, not just for wheeling but on icy snow covered boat ramps, soft shoulder side of the road parking, etc. The Pathfinder was incredibly better than the 92 S10 Blazer before it, but the Xterra is even more FUN! Revised first post to reflect new locker, 24F NorthStar AGM Battery & Hood Pneumatic Cylinders. Nice, did you get to use the locker on Sunday? Tony, sure did! Trail was very wet and muddy in places so I had a good excuse for using it. Not saying that the front locker was mandated, but it was fun getting used to it and the way it affects steering. Which is to say the X definitely wants to go in a straight line with the locker on, but not too bad. Next I may have to get a water proof alternator and a snorkel if those pesky beavers stay so active! Ok cool. Yeah in slop it definitely wants to go straight, a little less throttle helps. You'll notice it big time on hill climbs and rocks, grips and pulls you..
Revised OP to add the RCV Axles and list the removal of the front sway bar. And a huge thank you to Jeff Case (JAC04) for his 8 hours of major hep and for the use of his garage. For sure busting two axles in 4 months was taking the fun out of it for me. I still plan on upgrading the diff. side-shaft too, as the last final reduction/high torque component. 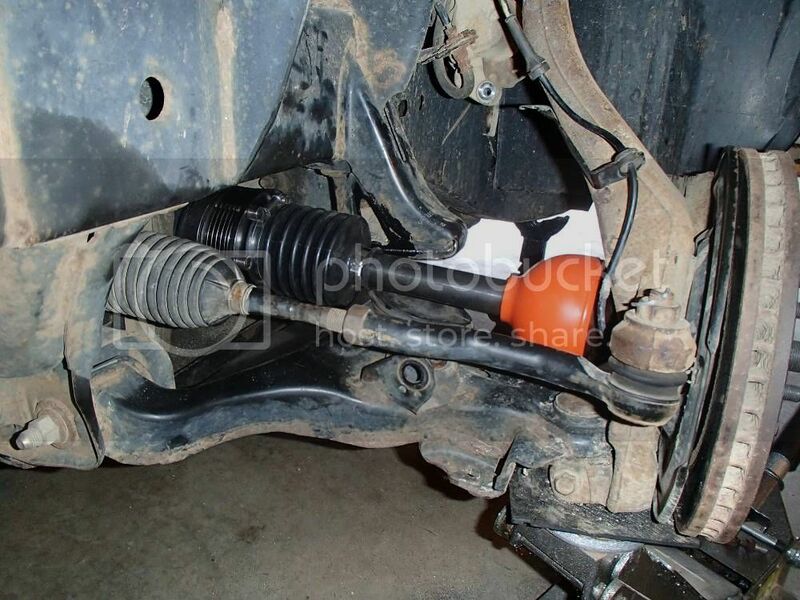 I'm going to continue to talk with CRV on these axles. It would have saved over half the installation time and problems if they had supplied a shorter or a tapered boot. We got the passenger side adjusted with no trimming but the driver side took a whole bunch of creative clearance creation on the bump stop weldment. See you on the Halloween Run? I committed (or maybe I should say, I should be committed) to regearing the X. I’m having Automotive Customizers, aka: 4x4parts.com build a R180 diff for me with an ARB locker, 410 gears and my RCV side shaft. Plus, the gearing and install parts for the rear. Pete at CT Axle will do the rear build and while it’s on the lift, bolt in the new front diff. I realize this looks a bit crazy since I already have a locked front, but no one has 410 gearing that will work with the Pro-4X’s 29 spline carrier. The built diff will cost me less than buying a new 27 spline locker, gearing, install kit and a 27-spine yoke and having them set up in my present housing. And this way I’ll end up with a complete / bolt in, low mileage, locked, 369 geared R180 diff and matching M226 369 gear set for sale, which should be a very nice /popular upgrade for anybody running an auto transmission off-road/Pro-4X running 33’s. With this upgrade including the RCV side shaft my whole final reduction front drive assembly will be upgraded to very breakage resistant status. ARB locker/carrier known for its robustness, eliminates the stock carrier spider gears. The RCV Side shaft is made from M300 steel and should be unbreakable with our 4-liter engine. Finally the mating RCV CV shafts, in place of the stock CV Axles of which I’ve twisted the inner splines off twice. Hope to be running the 410s in about a month! Hope to see you on the trail for the June run.